TRI Mommy TRI: First Race Win! At 12 weeks, I competed in a duathlon, consisting of a 2 mile run, 14 mile bike, and 2 mile run. I was excited for some quick, short distances. My plan for the run was to go at a pace that was fast (yet I was comfortable with), and then planned to hammer it out on the bike, knowing that it was a nice, flat course. My first run wasn’t anything impressive, as all the “real” runners took a decent lead ahead of me. I knew this would most likely happen, but I felt like the bike leg was more of my strength, and so I definitely hammered it out. It was exhilarating. I felt good, pushing my speed and catching up to the lead. I came off the bike with my fastest split ever (I averaged 22 mph) and headed out on the run, feeling comfortable, relaxed, and with adrenaline pumping. I held a pace that I could maintain and tried to keep my breathing calm and even. A woman flew by me at some point, and I knew I could not even attempt to stay with her. I crossed the finish line exhausted, but feeling good about how it went. Then I found out that the woman who passed me was on a relay team, and I was the first individual female competitor to cross the finish line! Best. Race. Ever! That was the first race I've ever been the overall female winner - and I was 12 weeks pregnant! From the start to the end, my body felt solid throughout the whole race. I wouldn’t go back and change a thing. The top male and female winners both received a jersey from Draft Cyclery (which I'm sporting in the picture to the right). 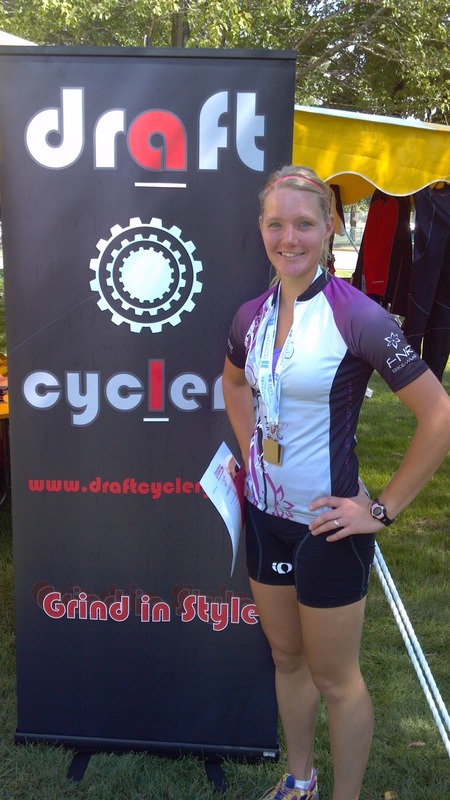 The conversations that I had with Draft Cyclery that followed ended up leading to a sponsorship by them! Now I'm decked out with a bunch of sweet bike gear for racing and training in both warm and cool weather – I would recommend them as they are worth checking out! So Many Opinions Out There!